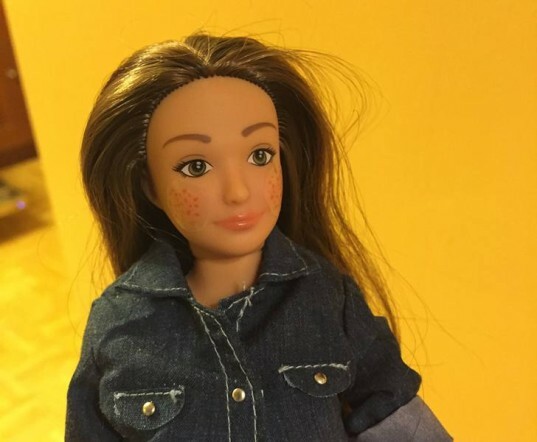 Learn all about the new Lammily Doll, a more realistic take on the traditional Barbie doll, plus see the hyper cool new Lammily Marks - sticker accessories that allow you to add real-life scars, cellulite, acne and more to your doll. The Lammily Doll is Here! 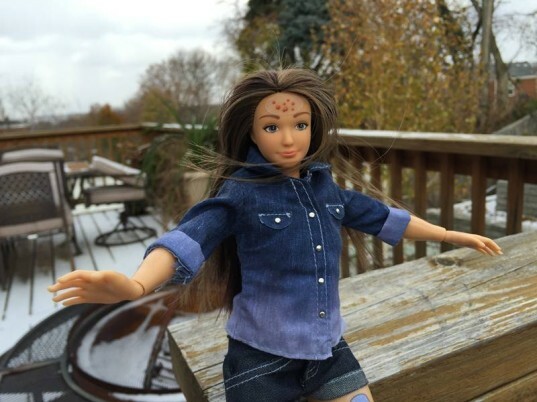 The Lammily Doll, nicknamed “average (or normal) Barbie” widely by the media, began as an art project in 2013. In spring of 2014, creator Nickolay Lamm took his art project a step further — crowdfunding his creation, and amazingly raising $501,000 for his $95,000 target goal. Now, the 1st edition Lammily Doll is available for purchase. The Lammily Doll features typical CDC measurements of a 19 year-old girl, plus wears minimal makeup and simple clothing. In a poll we posted when the Lammily Doll was still in the development stage, over 600 Inhabitots readers said they’d buy this for their child. However, when I first heard of “average Barbie” I wasn’t a huge fan. As I’ve noted before, I would have wanted a real Barbie when I was a kid, not some boring, non-lip gloss wearing “average” doll. Anti-pink, anti-Barbie sentiments are the new black, but I think all this pink hate has gone a bit far. It’s ok for kids to like pink (or not) and it’s ok for kids to like Barbie (or not). Kids are different and like different toys, colors and so fourth, so while I thought “average Barbie” was a nice idea for some kids, I’m also an advocate for kids who might like something more flashy and stereotypical-girly. Though I had some issues initially with the Lammily Doll, I’m way more on board now that Lammily Marks are in the picture. 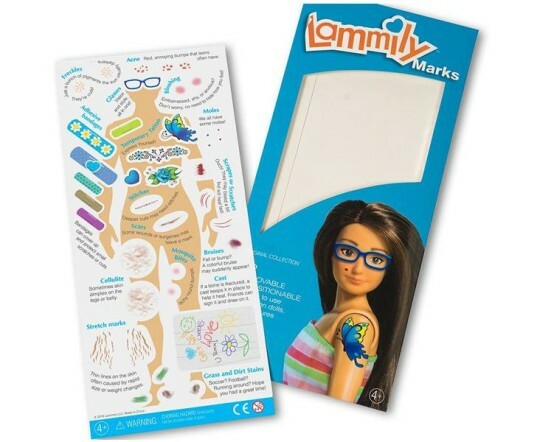 Lammily Marks are a set of pretty darn cool stickers that allows you to jazz up your doll with freckles, acne, scars, temporary tattoos, cellulite and yup, even stretch marks. Lamm notes that the idea behind the stickers is to better expose young people to flaws and changes that women’s bodies might go through over the different stages in her life. Lammily Marks clear vinyl sticker set is packed with stickers which can be re-positioned and reapplied to customize your doll. 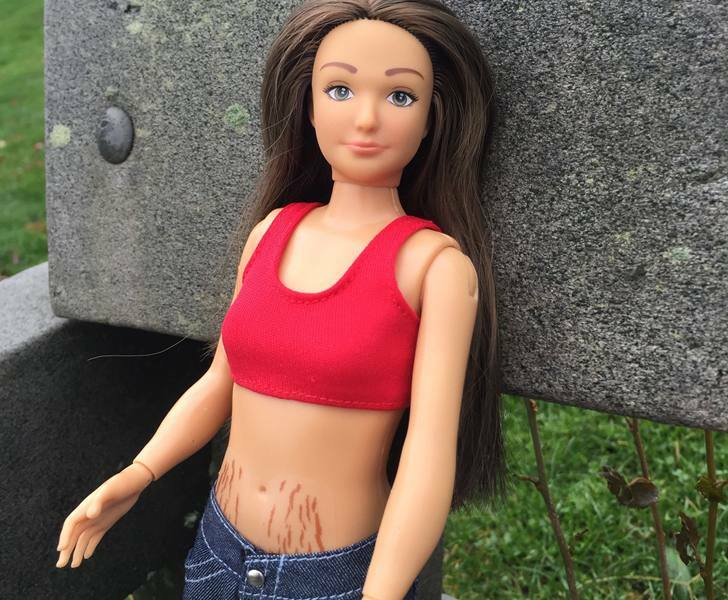 While I’m not sure why a young child would want to play with stretch mark and cellulite stickers (sure to be controversial), the fake tattoos, scars, freckles, mosquito bites, grass and dirt stains and other interesting stickers are sure to please owners of this doll. I know I would have had a lot of fun with them as a kid. It’s a very interesting twist on what might have been a not so interesting doll. 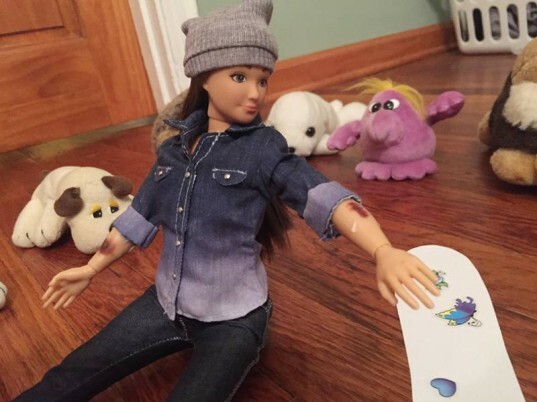 Check out the cool scars above that the Lammily Doll got while skateboarding! Kids will really enjoy stickers like this, that allow them to mimic real-life situations. The Lammily Doll and Marks are both available now, along with some fashion items at the Lammily website. RELATED | New Barbie Doll is Designed to Look Like the ‘Average’ Teen – But How Average is She, Really? 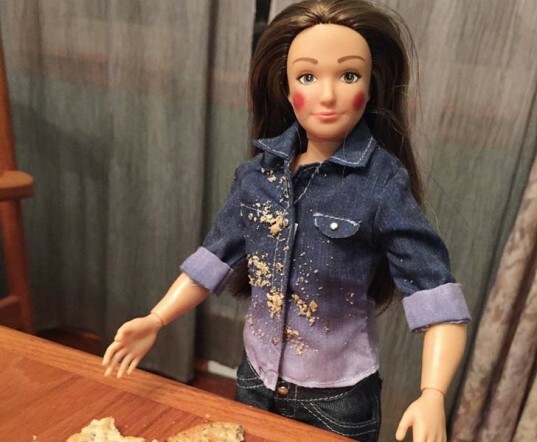 The Lammily Doll, nicknamed "average (or normal) Barbie" widely by the media, began as an art project in 2013. In spring of 2014, creator Nickolay Lamm took his art project a step further -- crowdfunding his creation, and amazingly raising $501,000 for his $95,000 target goal. Now, the 1st edition Lammily Doll is available for purchase. The Lammily Doll features typical CDC measurements of a 19 year-old girl, plus wears minimal makeup and simple clothing. In a poll we posted when the Lammily Doll was still in the development stage, over 600 Inhabitots readers said they'd buy this for their child. However, when I first heard of "average Barbie" I wasn't a huge fan. For one, I'm not an advocate of young kids, girls in particular, striving to be like everyone else (i.e. normal or average). Secondly, there's no way, in my opinion, to create an actual "average" doll. 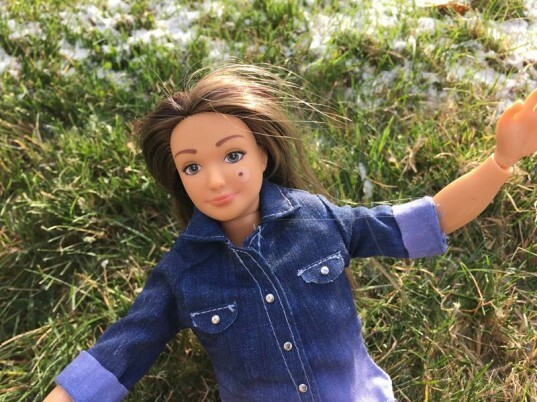 As I noted before, "This doll is a great idea – FOR PARENTS hoping to dispel what they consider to be certain negative stereotypes — BUT because average Barbie only looks like a VERY small handful of girls I’ve met, she’s technically not so average. To really achieve the average doll, we’d need a line of Barbies in MANY different shapes, sizes, styles and colors." As I've noted before, I would have wanted a real Barbie when I was a kid, not some boring, non-lip gloss wearing "average" doll. Anti-pink, anti-Barbie sentiments are the new black, but I think all this pink hate has gone a bit far. It's ok for kids to like pink (or not) and it's ok for kids to like Barbie (or not). Kids are different and like different toys, colors and so fourth, so while I thought "average Barbie" was a nice idea for some kids, I'm also an advocate for kids who might like something more flashy and stereotypical-girly. Though I had some issues initially with the Lammily Doll, I'm way more on board now that Lammily Marks are in the picture. Lammily Marks are a set of pretty darn cool stickers that allows you to jazz up your doll with freckles, acne, scars, temporary tattoos, cellulite and yup, even stretch marks. Lamm notes that the idea behind the stickers is to better expose young people to flaws and changes that women's bodies might go through over the different stages in her life. Lammily Marks clear vinyl sticker set is packed with stickers which can be re-positioned and reapplied to customize your doll. 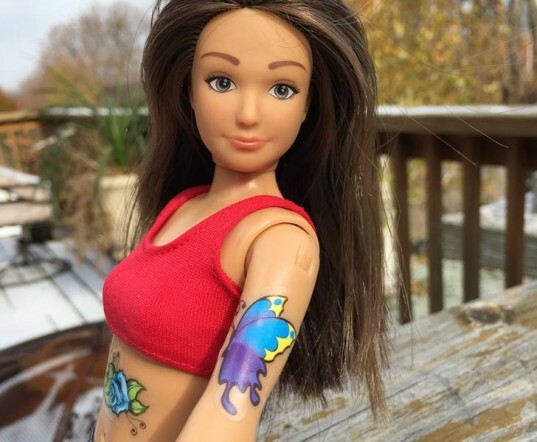 While I'm not sure why a young child would want to play with stretch mark and cellulite stickers (sure to be controversial), the fake tattoos, scars, freckles, mosquito bites, grass and dirt stains and other interesting stickers are sure to please owners of this doll. I know I would have had a lot of fun with them as a kid. It's a very interesting twist on what might have been a not so interesting doll.